Doctrina de ponderibus, monetis et mensuris per totum terrarum orbem usitatis. 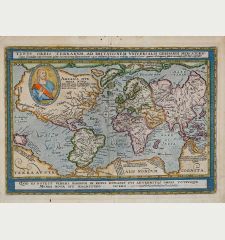 Antique map of the world. 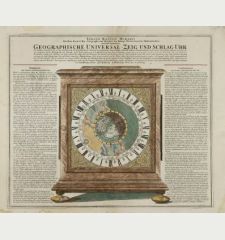 Printed in Frankfurt by Johann Nicolaus Stoltzenberger in 1628. 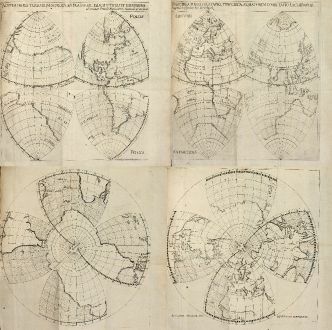 Two sets of globe gores in a projection based on Leonardo da Vinci's idea. Bound into Angelocrator's work on surveying techniques, solid and liquid substances, ancient and modern weights, precious metals and money. 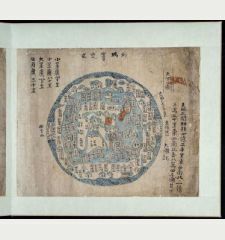 The world map is presented twice, once in the uncommon form of four gores on two sheets, and once with the gores re-arranged around north or south polar centres, also on two folding sheets. The book is often found incomplete, or else lacking all map sheets together. The map is rare [Shirley rated 'R']. The text engravings showing the solar system and a compass rose. 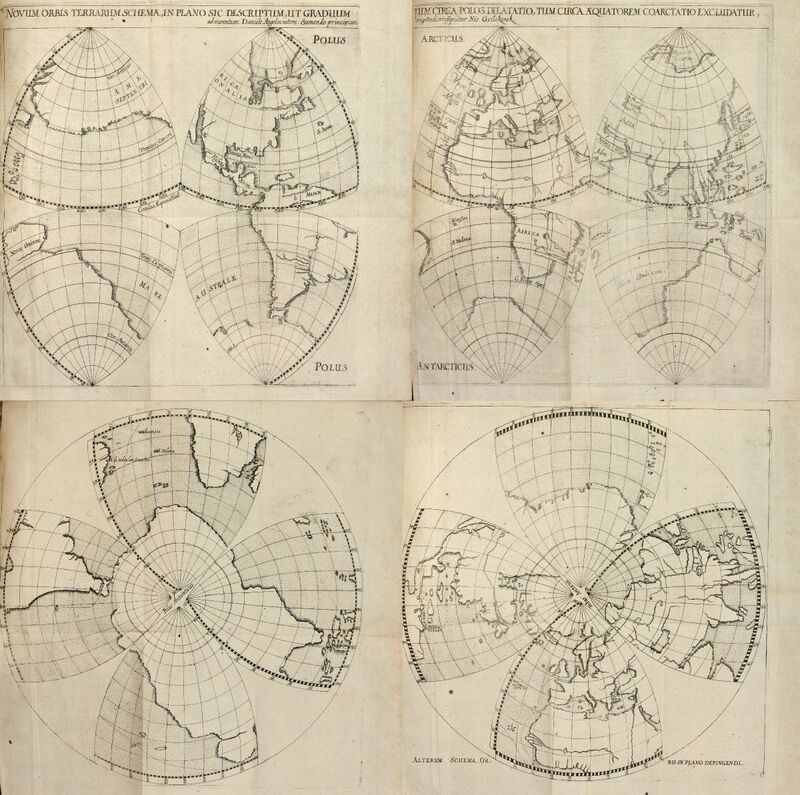 One such set of octant gores has been controversially attributed to Leonardo da Vinci. 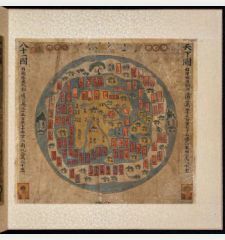 Although he may have sketched out ideas for such a projection, as the suggestive page from the Codex Atlanticus ... the drawing in the world map of 1514 does not appear to be in Leonardo’s style. 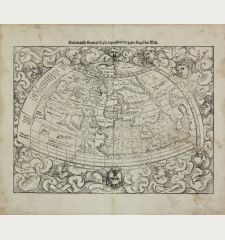 Later sixteenth-century versions occur in Oronce Fine's Sphaera mundi (Paris, 1551), in which he added meridians and parallels as equidistant, circular arcs within each octant; in one of the 1556 maps by Le Testu; and in a 1616 map by Daniel Angelocrator. 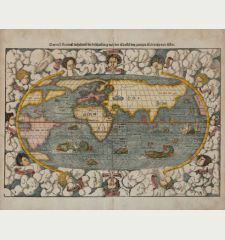 World map titles: Alterum Schema Orbis in Plano Depingendi. 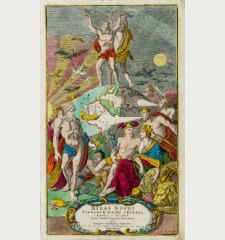 and Novum Orbis Terrarum Schema, in Plano sic Descriptum, ut Granduum tum circa Aequatorem. Coarctatio Excludatur, ad inventum Daniele Angelocratore. Sumendo principium longitudinis sequitur Nic. Geilekerck. Provenance: Bolle Willum Luxdorph (1716-1788), a Danish historian, poet and book collector. Inscription on front endpaper, referring to Luxdorph: 'Luxdorph, ex. anot., Jo. Erici, a consil. Conferent. d. 29 Oct. 1787'. Binding: 18th-century calf panelled in gilt and blind, front panel enclosing the Luxdorph device of an elephant head in gilt, marbled edges. Title Doctrina de ponderibus, monetis et mensuris per totum terrarum orbem usitatis. 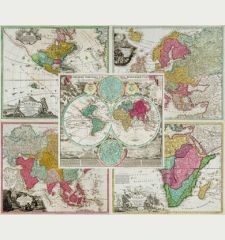 Illustrations woodcut titel, 4 copper engraving-folded maps, 2 copper engraving in text. 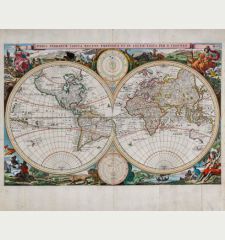 A few short tears to maps closed, some light browning of title and text. Angelocrator, also known as Daniel Engelhardt, was a German theologian, studied in Marburg and became Archdeacon in Marburg and superintendent of Koethen. 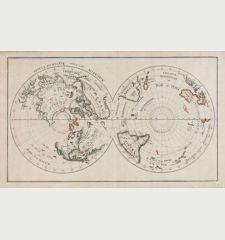 He is also known as a chronologist for his Chronologia Autoptica in 1601 and as cartographer for the world map in his Doctrina de ponderibus, monetis, et mensuris where Angelocrator developed a new projection of the spherical earth shape. Daniel Angelocrator: Doctrina de ponderibus, monetis et mensuris per totum terrarum orbem usitatis..